Where is the Capital of Virginia? 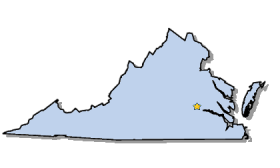 The Map of Virginia (VA) shows the location of the state capital in the "Old Dominion". Virginia has 95 counties, and the capital of the State is Richmond. On a map, the capital city is always indicated by a star. Interesting fun facts about Richmond including its history, location, county, current population, size of the city and the nickname of Richmond, Virginia. The Map of Virginia and map provides an outline of the state, which covers 42,769 square miles. The size of the state's capital city, Richmond, is 62.5 square miles. Test your recognition skills of the map of the state, and knowledge of its capital, with our State Maps Quiz Game. The location of Richmond is in the east central part of the state in the Piedmont region of Virginia at the head of navigation of the James River. Richmond is an independent city and not part of any county, Virginia. Each of the 50 states have their own capital city. The city of Richmond is the capital of the state of Virginia. The capital does not have to be the largest city in the state, but is usually centrally located either geographically or by population. 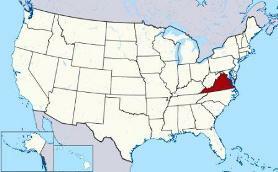 The State of Virginia is located the eastern United States. Fact 1: The Capital of the State is Richmond although the largest city is Virginia Beach. Fact 3: The population of the capital city is 210,309. Nickname "The River City"
Fact 4: Richmond is an independent city and not part of any county. Fact 5 on History: Native Indian tribes were the early inhabitants of the area, notably the Powhatan tribe. The site of Richmond was once an important village of the Powhatan Confederacy. Fact 6 on History: The Powhatan Confederacy was a cultural and political union of over 30 Algonquian speaking Native American tribes including the Powhatan, Potomac, Chesapeake, Secacawoni, Chickahominy, Mattapony, Pamunkey, and Mattapony. Fact 9 on History: The town of Richmond was founded in 1737. Its population rose and it became the capital of the Colony and Dominion of Virginia in 1780. Fact 10 on History: During the American Revolutionary War (1775–1783) the city was the site of several important events including Patrick Henry's "Give me liberty or give me death" speech in 1775 and the passage of the Virginia Statute for Religious Freedom that was written by Thomas Jefferson. Fact 11 on History: During the American Civil War (1861 - 1865), Richmond served as the capital of the Confederate States of America. Fact 13 on History: The city was eventually rebuilt and freed slaves and their descendants created a a national hub of African-American commerce and the city's historic Jackson Ward became known as the "Wall Street of Black America." The number of people, or the population of the capital city of Richmond, obviously changes constantly but the government statistics for the 2012 population of Richmond was 210,309, which provides a good indication of the number of inhabitants of the city. We hope that the interesting facts and information about Richmond will help kids and school children with their homework. Learn more by playing the States and Capitals Game. Richmond Nickname "The River City"